The Nations Cup is the third most important event in the international endurance calendar. Right after the World and the European Championships, the Nations Cup is part of the European circuit and is organized, this year in Portugal, Spain, France, Belgium, and Germany. Portugal Nations Cup is an open event and counts with the presence of the best horses and riders from the entire world, with a strong Arabian presence, represented by their Sheiks and Princes who practice the sport. 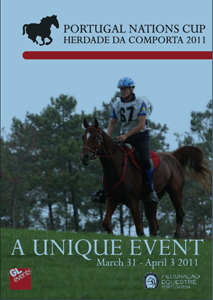 Regarding distance, the Nations Cup is institutionally categorized as a 3 Stars International Official ENdurance Contest (CEIO 3*), developed in 160 km/day, played by one set horse/rider. The level assigned to the Nations Cup means that there is a very strong turnout of audience, participants and media, generalist and thematic, with the permanent presence of journalists from magazines, newspapers and sports TV's, foreign and domestic. For this year there is alread a 120 minutes contract with RTP2 and SPORT TV and 15 days of promotion on the Ardio M80 10 times a day, making this event not only a safe mean of visibility for the sponsors but also a way to establish strong business relations with those countries in the Middle East, that strongly bet in this sport as a strategic relationship with the West.